When we think UX, we think about the ways we help our users navigate our website. Among various types of conversions (subscriptions, submitting a form, etc. ), the primary objectives are the conversions that directly translate to revenue. These conversions could be clicks that lead to advertising revenue, or checkouts that lead to sales. So we optimize our visual design, we optimize our navigation, we reduce any clutter, and the user generally finds it easier to navigate your website. But … what happens when the user doesn’t find anything they like, despite how fantastic the user experience is? What happens when there’s so much to consume that the thing they need is like a needle in a haystack? In this article, I’m going to talk to you about targeted user experiences, the careful art of finding out what users want, and delivering it. We can use these concepts to tailor content depending on the users’ needs. While some may consider this marketing, it’s actually a combination of both design and marketing. Design doesn’t always mean visual design. We’ll learn how to find out what users want using analytics, segment them into tailored email lists, then send them content recommendations via email. The same concepts can be applied to users visiting your website (i.e. “Popular content”, “You might also be interested in …”, etc. ), but since email UX is a very neglected aspect of design, we’ll be using that as an example. We’ll also talk about UX in regards to what happens when the user clicks on something they like in an email. the targeted approach, in which relevant emails are sent to segmented subscribers based on their interests. First things first: you’ll want to isolate your email traffic from any other traffic and make it so you can find out how individual email campaigns are doing. You need to know how your email efforts are contributing to your conversions in the grand scheme of things. With Google Analytics, this can be done with Tags and Advanced Segments. Start by creating link-tracking tags using the Google Analytics Campaign URL Builder. 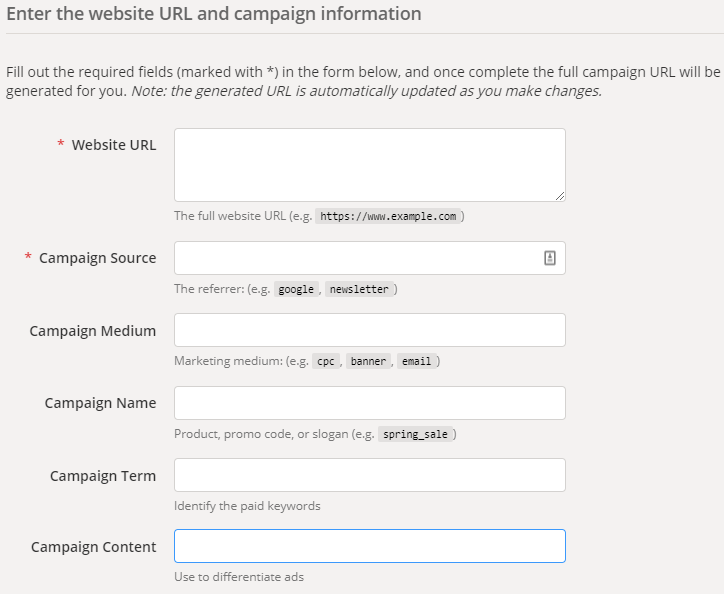 This will help you create URLs with utm_parameters that will help you track clicks and campaigns. Campaign Content: this is for A/B testing reasons—for example, if you wanted to create multiple versions of the same link inside the same email, this can be used to differentiate them (e.g. “text logo”, “image logo”). You’ll send your email subscribers to this link, where the utm_parameters you’ve defined will automatically be tagged as coming from your email marketing efforts. For every email link you want to track, you’ll repeat these steps. Although some email marketing software does this automatically, it’s important to know the underlying concept of how it works. 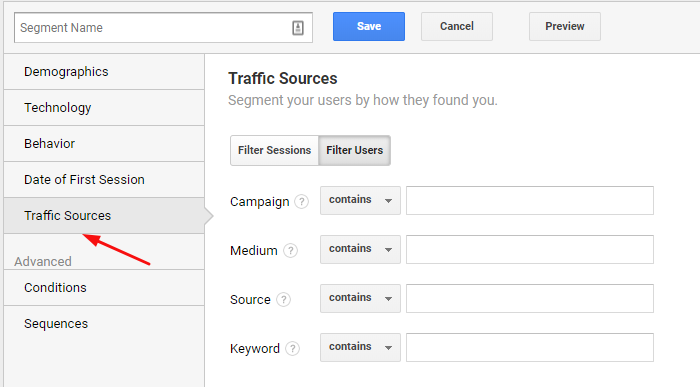 Next, we need to create Advance Segments in Google Analytics so that we can make sense of which users are clicking on what. From your Google Analytics dashboard, navigate to Audience → Overview, then click on the + Add Segment button (underlined in red in the screenshot below, in case you can’t spot it). 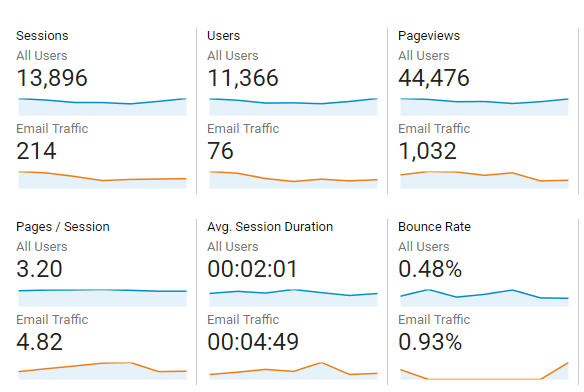 With utm_tags created and segments configured, any time you look at your traffic reports, email traffic will be displayed and compared alongside that of your normal traffic. This automatically isolates email traffic, making it easy for you to see how it compares to your other traffic sources. Your email open rate is insignificant. Ignore it. If you sent an email that was opened by 15% of your subscribers and your subsequent emails were opened by less than 9% of your subscribers, you might want to look why that is. Either something is functionally wrong and your subscribers are not receiving the emails, or you outdid yourself with that first email. Other than that, email opens as a metric is not very useful. Many devices (especially mobile devices) don’t track opens reliably. Instead, you’ll want to focus on clicks. Instead, use utm_tags to track user clicks. You’ll want to track all links in an email campaign, so that you can see if any links are outperforming others in a single campaign, or if a specific campaign is outperforming another campaign. Dive into the data and see which links are being clicked on. Now that you’re tracking clicks, you’ll want to one-up yourself and find out which of those clicks are actually converting (i.e. resulting in a subscribe, or a sale, or whatever). This is the ultimate metric. For example, here’s a terrific guide on tracking ecommerce transactions with Google Analytics. If you combine what you’ve learned here with that article, you’ll be able to see which emails and specific links are resulting in which conversions, and build your future campaigns based on that. Slowly but surely, and with the right integrated technology, you can then begin to target individual users based on their interests and browsing, searching and purchasing habits. Most ecommerce software will integrate with analytics software to allow this to happen. We call this personalization. Amazon is consistent with their emails. Inconsistency with either the visual design or the regularity of emails can be confusing for the user, and can even make them feel spammy. Amazon starts their emails by including the full name of the customer. You could opt for including the subscriber’s first name, or a simple salutation such as “Hey” or “Hi”. Regardless of what technique you use, embrace consistency, and possibly even implement A/B testing to see which technique results in more clicks. First, using their analytics system, Amazon is able to predict what the user wants by their user activity. Based on this, personalized emails are sent to that specific user on a consistent basis to ensure that the sale is closed. Consider this example where an Amazon customer was looking for digital cameras. He didn’t buy one, so Amazon followed up and sent nine different emails over the course of two weeks related to digital cameras. Pretty impressive. One of the major advantages of using analytics to boost your email UX is that it allows you to eliminate unnecessary extra steps for the user. Let’s take Amazon as an example (yes, again). Emails from Amazon direct you to the specific action that the user wants to take — whether that’s to buy an item, or to leave a review for one they’ve already bought. Amazon rarely forces you to somersault through all the hoops. Once you’ve segmented your user data and you understand exactly what a user group or specific user wants, you can then boost the user experience even further by removing any unnecessary steps. And to top it all off, ensure that your web pages load quickly! As you can see, the techniques discussed in this article can have a significant impact on your bottom line. John Stevens is a psychologist, sales and marketing consultant and the founder and CEO of Hosting Facts (latest review ). He is also a partner in the Website Setup blogging project. When he is not digging into psychology research, he is tending his beards.